China has entered a "new era" where it should "take centre stage in the world", President Xi Jinping says. 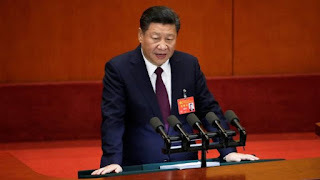 The country's rapid progress under "socialism with Chinese characteristics" shows there is "a new choice for other countries", he told the Communist Party congress. The closed-door summit determines who rules China and the country's direction for the next term. Mr Xi has been consolidating power and is expected to remain as party chief.